Last night I was getting ready, packing my bags, for my mutlti-conference road trip to Las Vegas for SWU and Orlando for Lotusphere when the phone rings. It’s late and I wonder who’s calling. While the phone is rarely for me, this call is, and it’s Scott. He’s reporting that he and Mandi have been in a car accident. Everybody is OK, but our car is not looking so good . In fact, it’s most likely a write-off. Eric and Dez are on the scene as “first-responders” and are helping out and keeping everybody warm while the details are exchanged. It seems like another vehicle slid through the stop light and showed up in front of Scott going south through a green light. We’ll this creates a little excitement and some tension around the house. 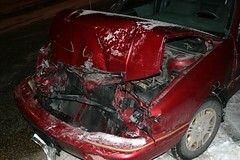 But the good news is there were no major injuries, just some scrapes, brusies and soreness. I’d tend to agree with Gartner on this one, wiki’s are on the move in the corporate world. Within IBM, anyone can create and manage a wiki but, I think the tooling will need to advance significantly (and 4 years is plenty of time for that) and the older generation who are not avid technology adopters will need to die off. The current generation just expects this stuff to be there, so there is no adoption issue for them. Starbucks as a Health Care provider. I new there was a reason for spending so much money at Starbucks! sailboat Originally uploaded by Big Dadoo. Today, I was reading The Sprit of Sailing while sipping on a Starbuck’s coffee in the living room. This is a very excellent book that Scott & Mandi gave me for Christmas. It combines two favorites of mine, sailing and photography. The pictures are very powerful and moving. In this one I can just feel the boat surging through the waves and gaining speed. Makes me look forward to doing more sailing this summer. I really enjoyed this book and cherish it very much. 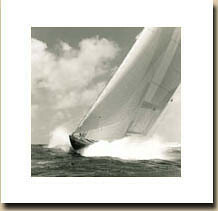 Michael Kahn combines the inspirational sailing photography and with equally inspiring quotes from many famous writers. My first favorite is on page 60 where he quotes Mark Twain. It may be a little early for New Years resolutions, but this describes the way I hope to live my life in the coming years. Taking more chances, trying new things, and living life to the fullest. I hope you will too. My second favorite quote in the books is by Oliver Wendell Holmes. What a powerful thought, that it’s not so much where we are right now, but that our path is set correctly and that we’re moving forward on that path regardless if it’s easy (with the wind) or more difficult (against it). Never stay at anchor, it’s hard to get anywhere that way. On Thursday I was working out on the Bowflex and especially focusing on building up my shoulder to recover from the shoulder separtion incident while listening to the Daily Source Code with the PodFather, Adam Curry when he played “Taking a Dump at Work”. I’m well into some difficult reps and concentrating hard but I have to stop because I’m laughing so hard. So, if you don’t mind a little “toilet humour”, give it a listen. After browsing on Digg for a few minutes I noticed the then #2 digg item on THX which of course lead reviewing the history of THX trailers to hear that classic sound. The Story of “Deep Note”For more than two decades, THX cinema and DVD trailers have been wowing audiences with state-of-the-art visuals and the famous “Deep Note” sound effect. Before launching the company in 1983, THX executives decided to leverage their wealth of creative talent and resources at Lucasfilm’s Skywalker Ranch to develop a promotional trailer. However, the company was looking for something that would be more than just another corporate logo flashing on the screen. With the shoulder injury from the MDH trip I never did say much about the rest of the ride. Here we are on Saturday morning and the boys are looking for a little something to do during a rest break. Well in this case it’s more like rock off, as in off the hill and down into the valey. Good thing we were not in a national park, there could be charges for doing this kind of stuff. this is what happens when you check out some blogs, trip off to a wiki, catch part of a web casr witout the audio, and then end up downloading some pre-release software. What’s the idea behind Flock? We believe that it should be easy for everyone to contribute to and participate on the web. To that end, we’ve started with integrating tools that make it easier to blog, publish your photos and share and discover things that are interesting to you. 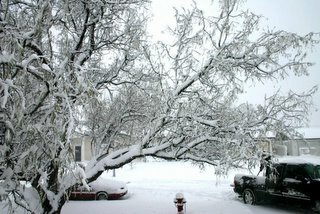 It started around 5pm yesterday, and this is what we woke up to this morning. A co-worker who was flying in from Toronto was diverted to Saskatoon and my son who has been out in his 4×4 this morning reported that several buses are stuck and blocking traffic. A good day to work from the home office as I listen to the dull roar of the neighbor’s snow blower. I’m hoping my “snow blower” (Scott) will look after our driveway, as he’s home today. His construction job with J&D Penner seems to have come to an abrupt end with the change in weather. Did I day burning bush? I meant burning brush; this stuff is definitely getting consumed. 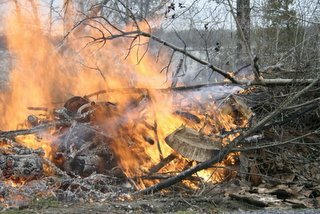 On a rare November trip to the lake where the weather was great with temperatures at +10 and no snow, we observed the annual brush burning event. A neighbor organized the burning pile through the year and several local cottagers contributing to the pile. This year we both participated in contributing to the pile and observing the burn. We’ve heard rumors that there is a big road party in conjunction with this activity but we were heading back into the city before there was any sign of a party but they had another couple of hours of active burning ahead. The wind was light but not from the best direction, I hope they kept everything under control. In years past we’d just see the charred remains in the spring and were none the wiser. Now we know how it happens.